This Race Tube replaces the central silencer for max performance and sound fitting inbetween the cat pipe and the back box. Looks great. This item is manufactured at the Sportex factory with an oval 125mmx 80mm tailpipe. Looks and sounds great with deeper, louder than standard bass exhaust tone. Back pressure is reduced producing power gains. Sportex performance exhausts are constructed using aluminised mild steel for pipe work. Looks great. This item is basically a centre pipe without the usual silencer fitted. Note this is not a working cat and will not pass an MOT . 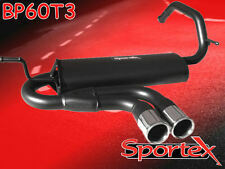 This Race Tube exhaust system replaces the central silencer and back box for max performance, it fits after the cat pipe. Sportex performance exhausts are constructed using aluminised mild steel for the boxes and pipe work and T304 polished stainless steel for the tailpipes. It bolts directly between the exit of the catalytic converter, and the inlet of the rear silencer on Fiesta MK7 1.6 16v PETROL engined models including the Zetec S model built in the period Aug 2009 - August 2013. This system can be fitted with either an LCB 3 branch manifold or the Sportex Big bore downpipe which allows the original cast inlet exhaust manifold to be retained. 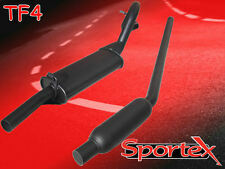 The Sportex competition performance exhaust system is designed to fit classic Austin, Morris, Rover, BL Mini's fitted with the A-series engine built before 06/1992. Pipework is 2". This product is basically the centre section of the exhaust system built without the usual silencer fitted. They sound great with deeper, louder than standard bass exhaust tone. Back pressure is reduced producing power gains. 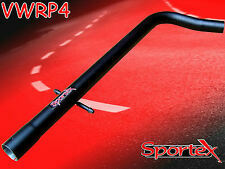 classic mini sportex exhaust side exit with single down pipe. taken from 998 mini , good solid condition, had good sound when on car , made garage roof rumble n vibrate on tickover. Will be refitting centre exit exhaust upon rebuild so this in way , . Collection only , mins from m6 j26 . thanks for looking. Its unique two piece design enables simple hassle free fitting. It has two separate oxygen sensor holes. Designed to increase engine performance by being less restrictive than the standard manifold/cat combination. For cars fitted with the original Ford exhaust system, the existing back box has to be cut from the exhaust system and the Sportex one will then fit to the Ford system. Single 3" round tailpipe design. Twin 3" round tailpipe design, 2.5"pip ework. Looks and sounds great with deeper, louder than standard bass exhaust tone. Back pressure is reduced producing power gains. Note: this is NOT a universal exhaust but a direct fit to the exact model of car shown. This Race Tube replaces the central silencer for max performance and sound. Looks great. Sports sound. Power gain. This side exit back box replaces the original back box for increased performance, good looks, reduced weight and sound. Exiting before the rear wheel on the passenger side of the car, suitable for both 3 door and 5 door. Looks and sounds great with deeper, louder than standard bass exhaust tone. Back pressure is reduced producing power gains. Single 3" round tailpipe design. 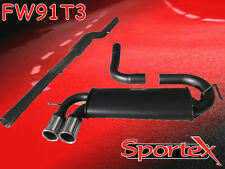 `VW Golf MK1 GTi Sportex Race Exhaust - Single 3"
To back up theirquality all Sportex systems carry a 30 month warranty. It is NOT suitable for Cabrio models built after Jan 1984, as the design of the system changes to suit the Scirocco floorpan that was employed for the later Cabrio models. Looks and sounds great with deeper, much louder than standard bass exhaust tone. Back pressure is reduced producing power gains. This combined 4-into-2-into1 Manifold and De-cat is a direct fit on all FORD Fiesta Mk5 1.6 16v ZETEC 'S' models built in the date range Jan 1999 to Dec 2001. THE IMAGE SHOWS THE ACTUAL FIESTA MK5 ZETEC MANIFOLD. Single 4" oval tailpipe design. Looks and sounds great with deeper, louder than standard bass exhaust tone. Back pressure is reduced producing power gains. Note: this is NOT a universal exhaust but a direct fit to the exact model of car shown. .4i, 1.6i, 1.8i, 2.0i (not turbo model) 2.2i 3 door, 5 door hatchback, estate, van, saloon, coupe built 1998-2005 WITH 2 BOLT FLANGE. This Race Tube replaces the central silencer for max performance and sound fitting inbetween the cat pipe and the back box. Single 4" Jap style tailpipe design. Looks and sounds great with deeper, louder than standard bass exhaust tone. Back pressure is reduced producing power gains.